It’s doubtful that more than a handful of people have ever heard of the Lowers-Minges LM-1. I discovered a three-view in a 1974 Flying magazine article about the up-and-coming Reno Unlimited class racing technologies. 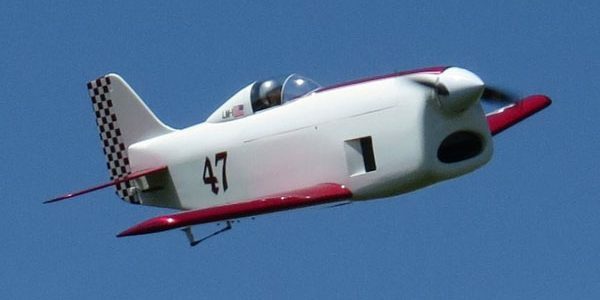 Though never built, it was to have been powered by a 500hp Ranger Inverted V 770 V12, yet it only had a 16.5-foot wingspan. No mention was made of methods or materials, but I suspect that it might have been planned to be of wood construction, like the Osprey GP-5. Small, undoubtedly fast, and no doubt a handful to fly, I thought it would make a great challenge as a model. Was I ever right on that one!I had an E-Flite Power 25 brushless motor sitting in a box and an E-Flite 60 Pro speed control, as well, so I designed the LM-1 around this power setup. I originally built the model with a scale wing planform, but it proved to be very roll axis sensitive, so I ended up adding a few inches to each tip. Although this helped in roll damping and wing loading, I also added some vertical to the fin and a lower skeg to aid in stability. This was necessary most likely due to the significant side area ahead of the center of lift and neutral point. I also built a simple takeoff dolly as hand-launches didn’t have enough speed for the controls to become effective. With all the bugs worked out, the LM-1 is now a great little ship but certainly not for the faint of heart or an inexperienced pilot—most likely just as the full-scale aircraft would have been! Because this is not a beginner’s bird to build or fly, I’ll just touch upon some of the more tricky and problematic portions of the build.